According to the United Nations, the United States spends more per capita on health care than any other nation in the world, yet ranks 42nd in life expectancy. Obesity—and its impact on chronic conditions such as hypertension, type 2 diabetes, and even asthma—contributes to this unfortunate situation. Experts agree that if the current obesity trends are not overturned, today’s children will be the first to have a life expectancy shorter than their parents. In their introduction, editors Rafael Pérez-Escamilla and Hugo Melgar-Quiñonez note that the future of the country’s well-being is closely tied to that of its Latino children. Several social, economic and environmental factors influence children’s health and well-being. Overall, Latinos in the U.S. confront higher levels of poverty and have lower levels of education and English-language proficiency. Because of financial instability, they have less access to healthy foods and health care services. In 2009, almost 35% of Latino children lived in households that experienced food insecurity, and obesity and diabetes are rampant in the community. 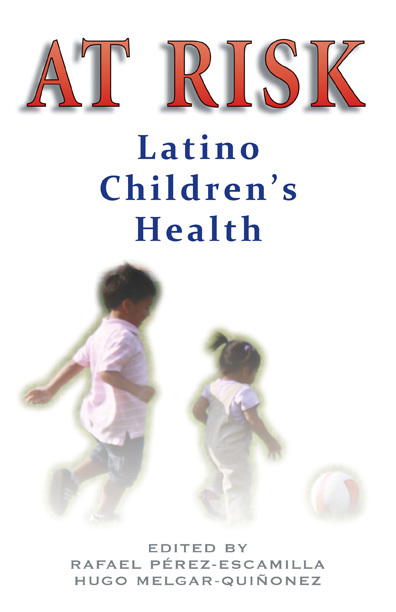 Written by the country’s leading experts in Latino children’s health, the ten articles included in this landmark volume examine the key issues that affect the well-being of the fastest growing segment of the U.S. population. Important topics influencing Latino children’s health that are covered include an evaluation of environmental issues such as unsafe housing, lack of access to healthy foods and safe playgrounds in low-income neighborhoods; the causes and adverse effects of obesity and ways to prevent this condition through school nutrition programs; an economic analysis of treating and preventing type 2 diabetes; and substance abuse in Latino youth. In each chapter, the major challenges and problems are outlined, and policy and programmatic changes are suggested. RAFAEL PÉREZ-ESCAMILLA, a professor of epidemiology and public health, is director of the Office of Community Health at the Yale School of Public Health. He is also the director of the Connecticut NIH Export Center of Excellence for Eliminating Health Disparities among Latinos (CEHDL), and he served on the 2009 IOM Gestational Weight Gain Guidelines Committee and the 2010 Dietary Guidelines Advisory Committee. He is currently chair-elect of the American Society for Nutrition’s International Nutrition Council. He is the author of hundreds of research articles, conference abstracts, book chapters and technical reports. His global public health nutrition and food security research has led to improvements in breastfeeding promotion, iron deficiency anemia among infants, household food security measurement and outcomes, and community nutrition education programs worldwide. He earned an M.S. in food science and a Ph.D. in nutrition from the University of California, Davis. He lives and works in Connecticut. HUGO MELEGAR-QUIÑONEZ is an associate professor in the Department of Human Nutrition at Ohio State University and a state specialist at OSU Extension. He received his doctorate and medical degree from the University Friedrich Schiller in Germany. He has done research in nutrition and food security at the Mexican Public Health Institute and the University of California, Davis, and he is the author of numerous articles on food security and community nutrition in immigrant Latino population groups in the U.S. and Latin America. He lives and works in Columbus, Ohio.